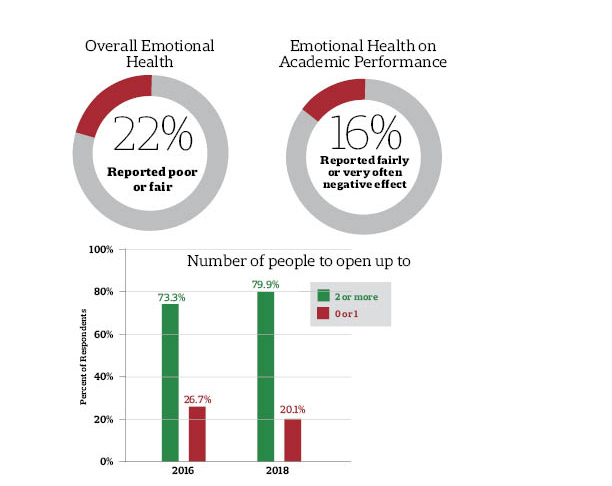 More than one in seven surveyed undergraduates reported their emotional health has had a negative effect on their academic performance in a recent wellness survey conducted by Harvard University Health Services in partnership with the Undergraduate Council. The questions in the survey were designed to paint a picture of the emotional well-being of the student body and their awareness of support mechanisms in place to address mental health concerns. Fifteen percent of survey respondents reported a currently diagnosed mental health disorder. Nonetheless, the rates of diagnosed mental health conditions at Harvard—depression, anxiety disorder, bipolar disorder, and substance abuse problems—are significantly lower than national college student rates, according to the survey. However, close to 45 percent of respondents indicated they have concerns about whether they suffer from an undiagnosed mental health condition. “Such concerns may be indicative of students’ need for more clarification and understanding of clinical vs. non-clinical mental health issues,” the report reads. Concerns about undiagnosed conditions showed significant gender differences. While close to 28 percent of female respondents reported concerns about anxiety and 23 percent reported concerns about depression, just 16 percent of males reported they are concerned about anxiety and 21 percent about depression. 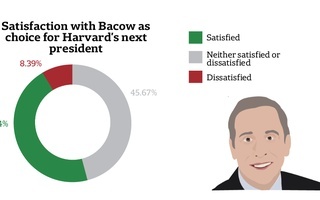 The survey, which is conducted biannually, was designed in part by the Undergraduate Council. The Council passed legislation in early February to conduct a separate survey on mental health, but ultimately agreed to join forces with HUHS in order to gain more “comprehensive” data, according to UC President Catherine L. Zhang ’19. 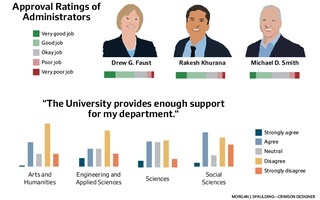 HUHS Executive Director Paul J. Barreira cautioned in an emailed statement that the results may not reflect the opinions of the undergraduate population as a whole, due to the relatively low response rate. 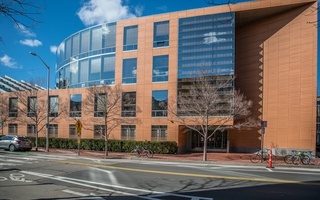 The survey results were weighted to correct for an imbalanced response rate between respondents of different genders, according to Karen Pearce, Director of the Harvard College Institutional Research Office and a co-author of the survey. “However, the data is helpful in identifying trends and engaging in conversations with the entire College community about ways that we can improve emotional and physical wellbeing of students,” Barreira added. The survey also found that large percentages of students do not know the location of peer counseling offices on campus. While slightly over 50 percent reported they knew the location of Room 13, an all-night student-run counseling group located in the basement of Thayer Hall, less than 20 percent knew where the offices of ECHO, Contact, Response, or Indigo were located. UC Vice President Vice President Nicholas D. Boucher ’19 said in an interview Tuesday that the lack of awareness among students about the whereabouts of peer counseling groups reflects a need to increase assistance for these groups and help to publicize their existence. A spokesperson for HUHS could not be reached for comment Thursday afternoon. Boucher said he would seek to use the Council’s reach to better advertise the availability of peer counseling groups to undergraduates. This year’s results showed improvements in some areas relative to the 2016 iteration of the survey. The proportion of undergraduates who reported they knew at least two people they could “open up to” about private feelings increased to 79.9 percent from 73.3 percent in 2016. In the wake of the survey, HUHS will seek to form a student advisory committee to discuss potential policy responses to the survey results, according to Zhang. “HUHS is pretty committed to making sure that there is student input as we continue to design surveys and as we continue to take the results of this survey and put them towards actionable policy changes,” Zhang said. The mental health crisis facing modern lawyers has been reported so extensively, it barely needs repetition. Yet the causes have been woefully overlooked.